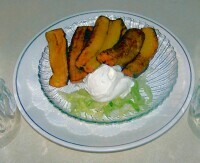 Ripe fried plantains (sweet) served with sour cream. Chunks of fresh fish marinated in lemon and Peruvian herbs. Sauteed shrimp with olive oil, garlic and sherry wine sauce. Shrimps, mussels, scallops and fresh fish. sauce. Served with O'Brien potatoes and fruit garnish. 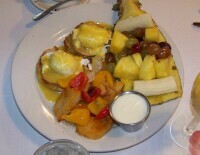 Two English muffins with spinach, two poached eggs and hollandaise sauce. Served with O'Brien potatoes and fruit garnish. and ranchera sauce and fruit garnish. Three scrambled eggs with poblano sauce. Served with O'Brien potatoes & fruit garnish. Three slices of French Toast, two eggs any style. Served with fresh fruit. Chicken Romaine lettuce, tomatoes, onion and fruit. Cool platter served with fruit. Classic South American Dessert - A rich Coconut custard dessert topped with our own caramel sauce and fresh strawberry pieces. Vanilla Ice cream topped with coconut, pecans and drizzled with our own caramel sauce. Pineapple and banana filled tortillas, drizzled with our own special caramel sauce, garnished with fresh starwberries and served a la mode. Prepared by our Chef's own personal recipe, garnished with fresh strawberries and finished with creamy whipped topping. An authentic Mexican Favorite sponge cake served with a delicate sweet cream, whipped topping, chocolate sauce and fresh strawberries. Sweet apple filled tortillas with caramel sauce, fresh strawberries, and served a la mode. Fresh strawberries served with a sweet Kahluha syrup and finished with a creamy whipped topping. All of our desserts are made from scratch here on the premises. Only the freshest ingredients are used to make these delicious desserts.